The Barneveld-Brigham Fire Department is made up of a dynamic group of volunteers looking to give back to the community we live in. 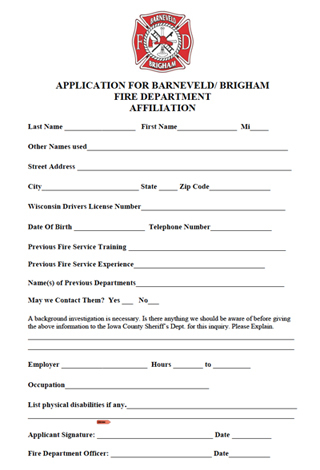 All who possess the desire and determination are welcome to apply to join the department in order to protect and serve Barneveld, Brigham and provide mutual aid to the surrounding communities. If you’re interested in joining the department, please fill out the application. To electronically fill in this form, simply download and "SAVE AS" to your computer. Once it is loaded on your computer you will have the ability to type in the spaces and re-save it. The application form is in PDF format and requires the free Adobe Acrobat Reader application to view.